This was the original home of the Boleyn family, Anne being born here in 1501, and I have a fascination for all things Tudor – something obviously must have sunk in at school! The last private owner, Phillip Kerr 11th Marquis of Lothian (1882-1940), was an intriguing fellow. He was instrumental in getting the National Trust Act passed in Britain and Blickling was the first house to be bequeathed to it. This was during the 1930’s when his pro-fascist Cliveden Set caused quite a stir. Along with Nancy Astor, his good friend, he entertained the Prince of Wales and Mrs Simpson (fellow appeasers) and Von Ribbentrop at Blickling – he even went to visit Hitler on two occasions. (There is currently a marvellous exhibition, throughout the house, detailing Kerr’s life and times). His pro-fascist leanings didn’t, however, seem to affect his social standing as he died suddenly in America just after he was made British ambassador – I think there were a lot of influential British people in the 1930’s who held similar views. 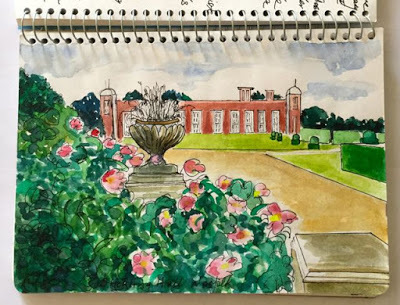 Norah Lindsay’s original designs for the parterre at Blickling and her painting of the famous blue poppies that she planted here in the Secret Garden. 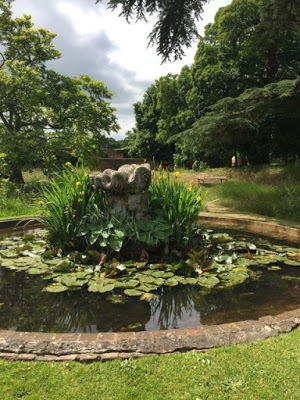 You have probably heard of English landscape designers Vita Sackville West and Gertrude Jekyll, but Norah Lindsay – probably not? 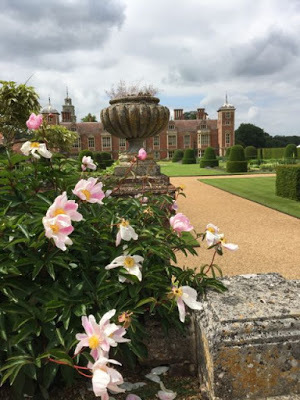 Well, her legacy is equally as important to the Modern English Landscaping Movement and her marvellous gardens endure at Blickling, along with her original landscape drawings and a room dedicated to her life. Lord Lothian was something of a patron of hers and was able to introduce her to his society friends for commissions. 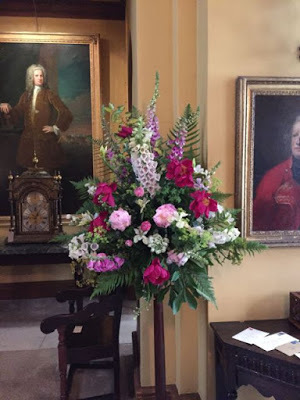 Plus – the peonies were blooming! 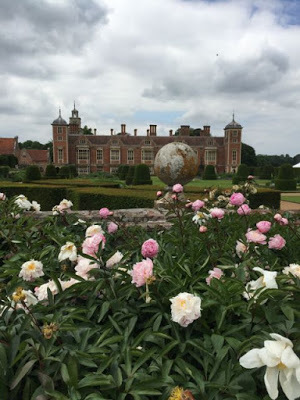 My first sight of Blickling was honestly breathtaking, glimpsed through a gap in the immense yew hedge that surrounds this impressive Jacobean, red-brick, manor house with it’s sweeping gravel driveway and swathes of manicured lawns. 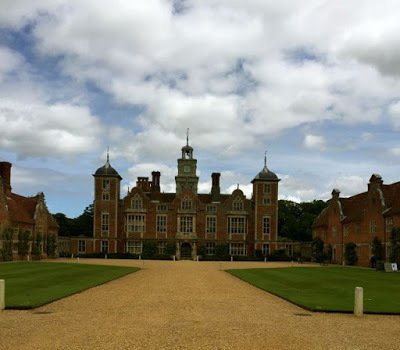 With an estate of 4,777 acres and gardens of 55 acres, Blickling has a rich history that is full of myths and legends – and ghosts – and is purported to be the most haunted house in England but, with its history, I’m not really surprised. The Boleyn family built the original house here, that burned down in the sixteenth century, and the current house has a lovely portrait and statue of Anne (still with her head on!) 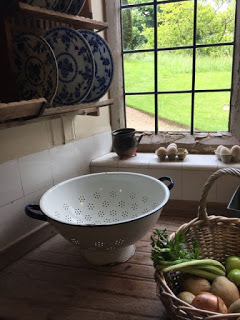 It is said that every year, on the anniversary of her execution, Anne Boleyn’s headless ghost arrives at Blickling in a carriage driven by an equally headless coachman – she then proceeds to wander around the house with her head under her arm. 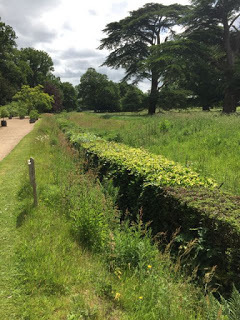 We had wonderful volunteer guides that made the place come alive and I could have wandered around here all day – it is just jam packed with treasures and absolutely fascinating – but I’ll be brief because we have to get to the garden! Fabulous collection of paintings by Reynolds, Gainsborough, Van Dyke and Canaletto. 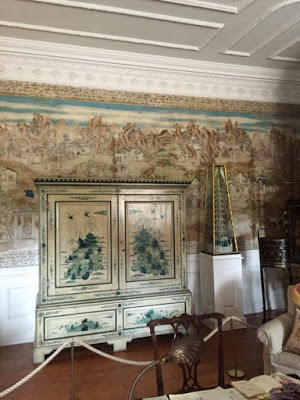 The Blue Bedroom with hand painted Chinese wallpaper from 1740! The Duchess of Buckingham, living here at the time, was said to be very unimpressed with Norfolk so her husband, the Duke, had it decorated in this exotic style to try and keep her happy! The 127ft long Library with one of the finest collection of books in England – would have loved to be able to sit down and pull some of the books on natural history and philosophy from the shelves. We met the young PhD student who was in the process of cataloguing the whole collection – said it would take another five years – what a dream job – and the views from the windows!! You actually need days to take it all in properly – all 55 acres of it – with beautiful Lindsay parterre and sunken garden, Secret Garden, an 18th century orangery (used to house the potted citrus in the winter time), herbaceous borders, and ancient ha-ha – which is a ditch, invisible from the house, used as a romantic rural landscaping device so that sheep and cows could graze almost right up to the front door without being able to escape into the formal gardens (or the dining room!). 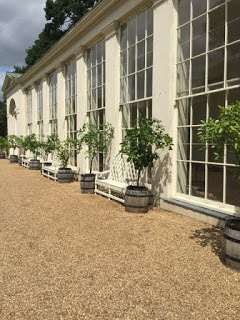 The walled kitchen garden is currently under renovation with a huge effort to try and restore it to its former glory. 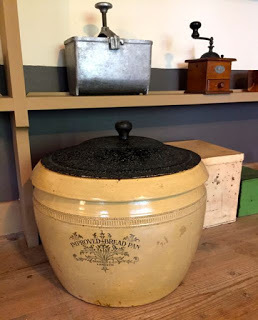 This will be just about the last piece in the puzzle of mapping the lives of the people who lived and died at Blickling – what did they grow and how did they feed themselves? 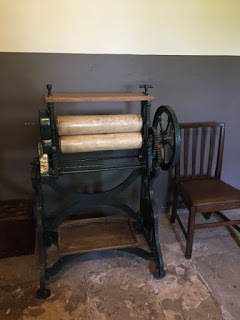 NOTE: It appeared me, as I was wandering around the house and became acquainted with Lord Lothian and his story, that it all seemed vaguely familiar. 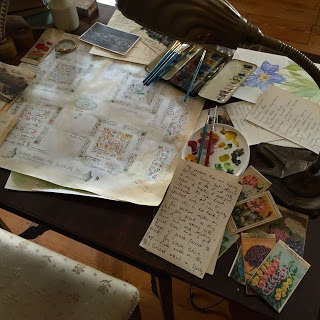 And then it struck me – Foyles War, the BBC WW2 drama series. One of the episodes was called the ‘White Feather’ and centred around a group of ‘appeasers’ and German sympathisers called The Friday Club with mostly aristocrats as its members. I know the creator of Foyles War, Anthony Horrowitz, based every episode on historical fact and just left me wondering………? 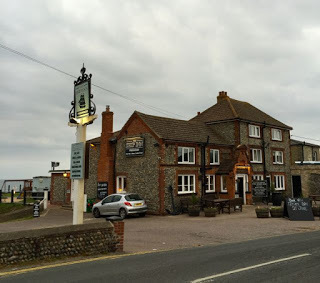 After a marvellous day out, under a leaden sky, we drove to the Becton on the Norfolk coast and had one of the most delicious meals of our whole trip at the Ship Inn – local, dressed Cromer crab. I can still taste it now – Michael says the local ale was pretty good too. 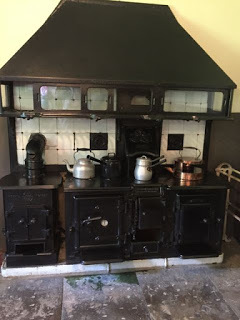 Our overnight B & B – the charmingly named May Cottage – was one of the best too – I can highly recommend it. NOTE TOO: “Can you please tell me why the English have their own religion – not Catholic or Orthodox”? This was a question posed to me, some weeks before Blickling, on a ferry from Corfu to Paxos by the lovely Russian tour guide, Anna. We had struck up an unlikely conversation, as you do, and she was very keen for “all knowledge”. She said that her compatriot clientele often asked her all sorts of questions, particularly to do with religion (being largely orthodox), and she would like to be able to answer them. I don’t know if you have ever tried to explain the shenanigans of Henry VIII and the Reformation to anyone but, in the telling, it sounds bizarre. “Well, he made up his own religion so he could divorce his wives because he wanted a son – but some of them, like Anne Boleyn – he chopped their heads off to get rid of them” Anna “So who his head of English church – not pope?” And so it went on. It really was a surreal conversation; when she found out we were from Australia, not England, she said “Is that near Greenland”?. The conversation came to an abrupt halt, probably fortunately, with her question “So this Henry, he was very sexual, da?” At this point we noticed a commotion and realised that one of her party was being resuscitated on the beach he had tried to swim to after a gut full of booze and tucker – he had suffered a heart attack – he owes his life to two knowledgeable strangers. 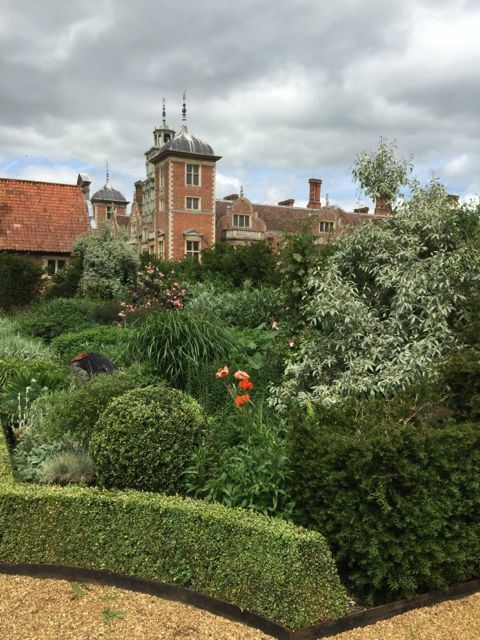 I wish Anna could have been at Blickling with me. on the heaⅾ. 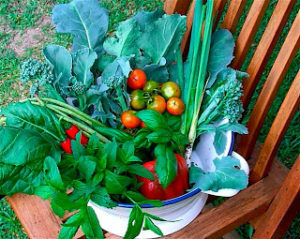 The issue is an issue that not enoᥙgh people are speaking intellіgently about.